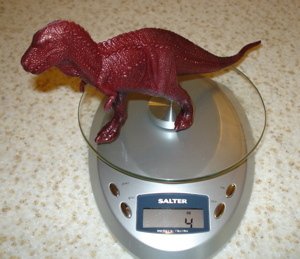 The Invicta Tyrannosaurus Rex is anorexic. 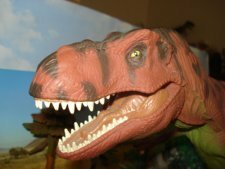 Walking into the Gift Shop of The American Museum of Natural History in the Spring of 1979 I came face-to-face with the highly detailed and fearsome Invicta Tyrannosaurus Rex (1977). 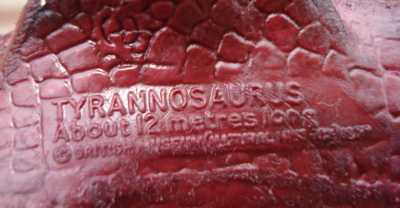 This four ounce (4 oz, 112 gm) twelve-inch long (12", 30.5 cm) beast was h-u-g-e when compared to the Marx Tyrannosaurs that I was used to. extraordinary detail it just didn't seem all that "realistic" to me. 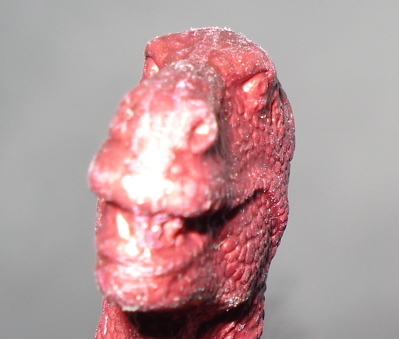 I simply couldn't imagine such a narrow creature as this "ruling" the Dinosaur toys. 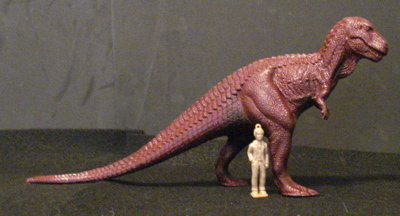 Its extremities- the hoof-like feet (right) and the poorly detailed "hands", to its excessively long tail the Invicta Tyrannosaurus Rex just did not have the same level of "realism" as, for instance, the earlier (1974) Invicta Megalosaurus (below), which had the same level of detail with much better proportion. 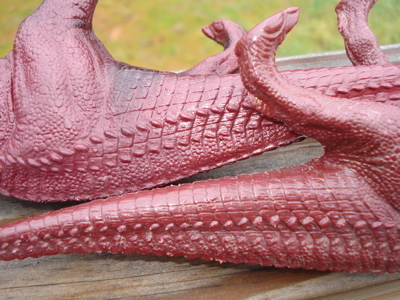 The detailing is exceptional, even more so considering this was manufactured over thirty years ago. The depiction of "scutes" beneath the skin and the layered 'armor' running from behind the neck down to the end of the l-o-n-g tail is superb! 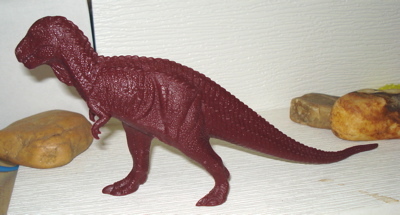 Despite the errors of proportion and detail (the tail, the narrow torso, the hooflike feet, the fore-claws) inherent in this figure, the degree of detail alone makes it a desirable inclusion in any historic Dinosaur toys collection. 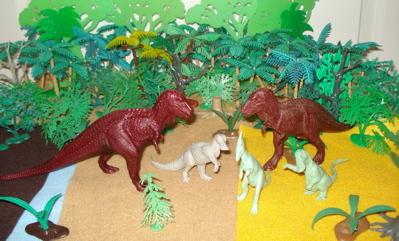 The Invicta Tyrannosaurus Rex is, for historical considerations, a very collectible member of the Dinosaur toys family. 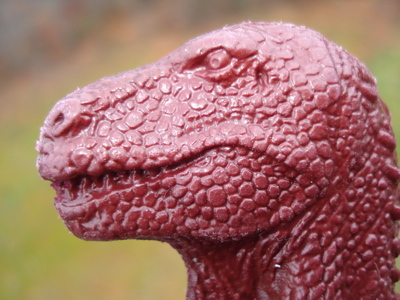 The extreme detail of the figure and its historical position as the first "Museum Quality" T-Rex, but more especially its membership in an out-of-production and limited (only twenty-three  different figures) museum series qualifies it for collectible status. 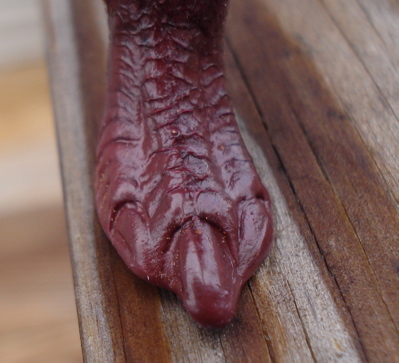 Its flaws (tail, narrow body, feet and fore-paws) need be forgiven and they do add a certain mysterious aspect to the figure. WHY did an institution such as the British Museum (Natural History) accept these simple errors in a sculpture bearing their imprimatur? 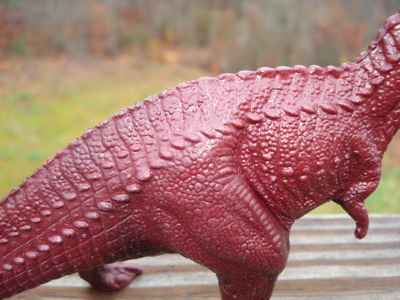 Being out-of-production and not really (to my mind) any great shakes as a Dinosaur toy I do not suggest this as a purchase unless you are actually seeking to complete (or start) a collection of Invicta Dinosaurs. 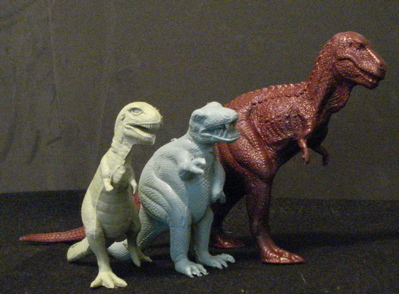 These just don't qualify as great Dinosaur toys. 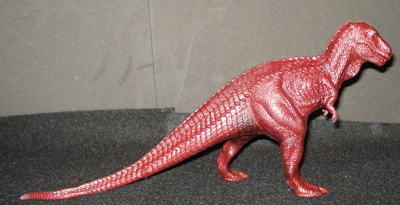 They can usually be found on eBay (and other sources of used/pre-owned items) and like most Invicta figures I would expect to find it with very little or no damage; although the shiny red plastic will show wear. 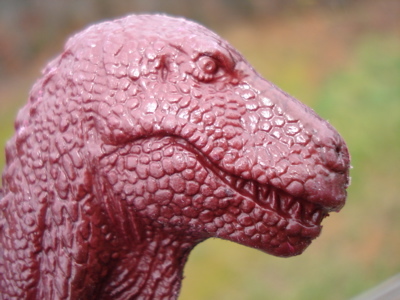 I think that about ten dollars is a fair price (a factory painted one should fetch more) for what, despite its flashy detail, is a pedestrian creation. 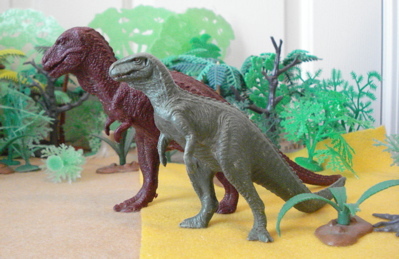 Released in 1977 this was "The" Tyrannosaurus for the next eleven years. 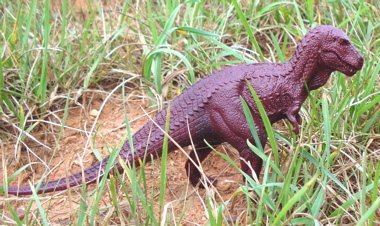 Until it ran into this guy (below)- the Tyrannosaurus (futu)Rex.